On Thursday 10th May 2018, more than 70 consultants and other guests joined the ECA and DWER for an interesting and informative evening of ‘Understanding the Department of Water and Environmental Regulation’s ‘One-Stop-Shop’. Earlier this year, the Minister for the Environment announced a new ‘one-stop shop’ service for water and environmental assessments and approvals. Proponents who require environmental and water approvals can now engage with DWER through a single contact point supported by a new internal framework. To find out how this is proposed to work, we were joined by key DWER representatives to explain how the new structure will simplify the approvals process, improve proponent access to government services and overall response times. Kelly Faulkner – Executive Director of DWER and Anthony Sutton – Executive Director of EPA Services, DWER, the speakers provided a clear summary of the historic and current challenges facing the Department, but with a positive outlook on the future and better outcomes for proponents and ultimately our clients. 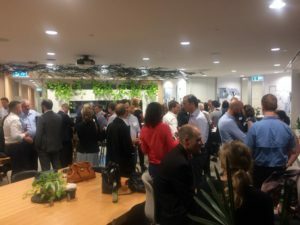 Mike, Kelly and Anthony encouraged proponents to engage early with DWER and for those who are willing to make the long journey up the freeway to Joondalup – some impressive new offices and facilities to enjoy, potentially for future joint events. 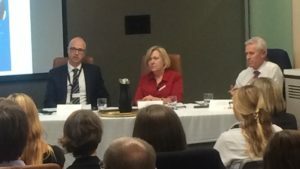 While increased fees are never happily welcomed by industry, we hope that these measures go some way to assisting the Department meeting its resourcing requirements to ensure that its functions can be adequately deployed, and the increased fees are offset by the benefits of more effective services for both industry and the environment. We would like to sincerely thank Mike, Kelly and Anthony for taking the time to present to ECA members and for Lavan for hosting us so graciously. For those who couldn’t make it along to the event, the presentation provided by DWER can be found HERE.